The Nordschleife layout. In the bottom left is the Südscheife – the two together made the full circuit. As Formula 1 has left Europe for the 2010 season, it is almost certain that many will gripe about some of the modern tracks that the series will visit over the next six weeks, while praising the gems that are Interlagos and Suzuka. Those two circuits have become treasures within the wider community of Formula 1 and it is very easy to see why. The sweeping corners, fast straights and terrific challenges that they present hark back to the days when Formula 1 truly was the toughest form of motorsport in the world. Add to that, their individual styles also made each race stand out a great deal. The curse of some of the modern tracks is not merely their layout, but the fact that they are designed, structured and built by the same team of people, led by one man. It only requires a short time on any racing simulator and the nature of how similar modern F1 circuits are to eachother becomes quite apparent. A few months ago, I briefly wrote about the Benguela circuit in Angola – the fantastic little course touring car and motorbike course was simply wonder to drive (albeit it on a simulator). With only nine corners over a 1-and-a-half mile stretch, it was fast and fun – Valencia with 25 turns over 3.3 miles does not give me such a thrill due to its stop/start nature. Times like these make me want to flashback to “simpler times” and ironically the “simpler times” do not get much tougher than Germany’s magnificent Nordschleife. The ‘Green Hell’ (as nicknamed by Sir Jackie Stewart) was used in Grand Prix racing until 1976 and actually the northern loop of the whole circuit and came in at a mere 14.1 miles with 160 corners. 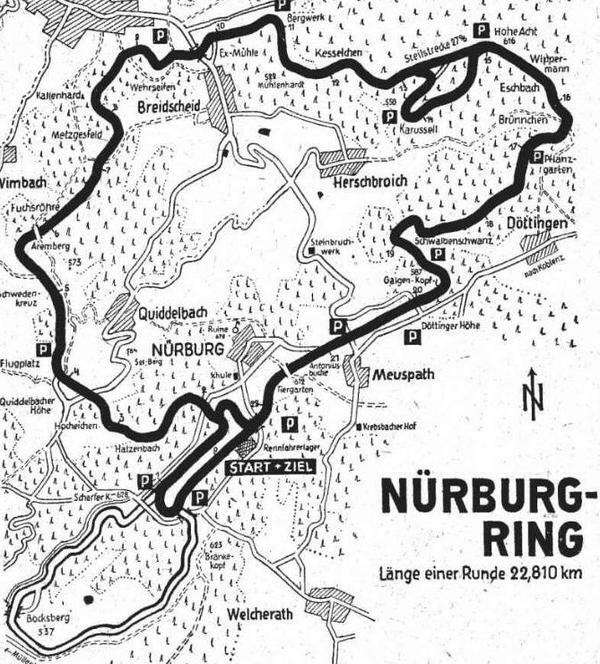 The full circuit – known as the Gesamtstrecke – connected both the Nordschleife and the Südschleife (southern loop) was came in at 17.5 miles with 187 corners, but after the start of the Second World war, the full circuit was never used in competition again. The Nordschleife clung on to its Grand Prix place until Niki Lauda’s fiery accident on the opening lap of the 1976 German Grand Prix sealed its fate. The circuit was dropped and replaced on the Formula 1 calendar with the Hockenheimring and would not return until 1984 in the guise of the Nurburgring, when it stands now in a much shortened format. Admittedly, even in the safe environment of a simulator, the Nordschleife seems incredibly daunting and it can be quite hard to keep ones concentration up when corner-after-corner come at you virtually non-stop; so here are some people who did it for real… some of whom also happened to be quite fast too. Wow, nice find with the onboard footage that course looks so tough. As I said, I’ve driven it on the sim – you have no idea how tiring it is until you try it. I cannot imagine what it’s like for real. Mind boggling. There’s also a great video of Nick Heidfeld doing the lap in BMW’s 2006 F1 car somewhere too. I wish they had shown the whole lap onboard but I guess the original audience it was aimed at would not have sat through that. As far as I know, there was also a case of the signals fading in and out amongst the more dense forest areas of the circuit. Monza is a good example of a track that still has that problem for car/pit radio signals too.